48 years ago today, Jose Feliciano made headlines across the nation after singing "The Star Spangled Banner" at The World Series. (Folks weren't keen on his interpretation of our National Anthem.) A single released of the live recording stalled at #46 a month later. Jimi Hendrix turned heads when he did his screeching guitar-assault version at Woodstock a year later ... but Jose's rendering was probably the most talked about performance of our National Anthem until Roseanne Barr did her crotch-grabbing version at a San Diego Padres / Cincinnati Reds game in 1990. I love FH when you surprise us with unexpected posted music like you did on Thursday. and Micky Dolenz is back on February 11th for an All Monkees Hits Show. Call it a Pleasant Valley Friday! 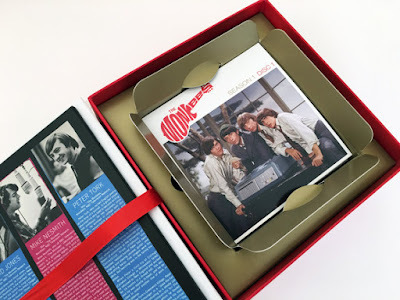 We're pleased to announce that The Monkees THE COMPLETE SERIES on Blu-ray is once again coming off the assembly line and is ready to ship right to your door. We've resolved the prior shipping issues that caused a small number of boxes to arrive with minor damage, so order with confidence. 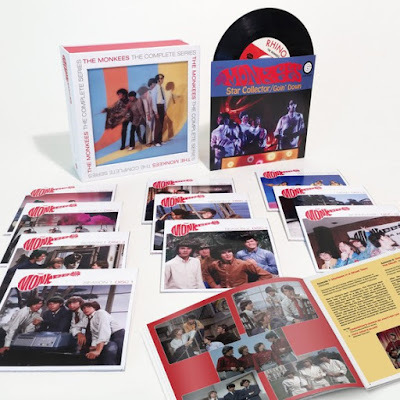 • All 58 episodes, newly remastered in stunning HD from the original negatives for the very first time, plus the 1969 TV Special "33 1/3 Revolutions Per Monkee"
• Unique packaging including a 7" featuring "Star Collector" b/w "Goin' Down" in unique TV mono mixes available ONLY in this limited edition! · A bonus disc packed with hours and hours of outtakes and vintage TV appearances available ONLY in this limited edition - once this sells out, you'll never be able to get this material again! · Episode 19 "Find The Monkees"
· Episode 56 "Some Find It Lukewarm"
And take a look inside the box here. Fresh from their August induction into the Rhythm and Blues Hall of Fame (http://rhythmandblueshof.com/) , R&B legends Mary Wilson of the Supremes and Eddie Holman will be among the great musicians who will fill the star-studded “Legends of R&B and Doo Wop” concert lineup at Highlander Auditorium in Upland, Michigan. Wilson, Holman, The Original Tymes and Harold Winley and The Clovers will all take to the Highlander Auditorium stage for a blockbuster trip down memory lane on Saturday, Dec. 10. Presented by Affordable Music Productions, Legends of R&B and Doo Wop tickets may be purchased at www.affordablemusicproductions.com or by calling 1-888-718-4253.
setting the stage for one of the most successful singing groups in recording history. “Where Did Our Love Go” reached No. 1 on the U.S. pop charts in 1964, followed by five consecutive No. 1 hits: “Baby Love,” “Come See About Me,” “Stop In the Name of Love,” and “Back in My Arms Again.” Wilson has gone on to perform on dozens of hit records, while also enjoying a career as a best-selling author, stage and screen actress and much-requested lecturer. was inducted into the Vocal Group Hall of Fame in 2005. Tickets are $49, $59, $69, $79 and $89. There are no service fees and parking is free. Highlander Auditorium is located at 850 N. San Antonio Avenue (at Foothill Boulevard) in Upland. British Songwriter Rod Temperton, keyboardist with Heatwave and composer of their hits "Boogie Nights" and "Always And Forever", died of cancer Wednesday (October 5) just four days shy of his 69th birthday. Rod also wrote several Michael Jackson hits, including "Thriller", "Off The Wall" and "Rock With You", George Benson's "Give Me The Night", Michael McDonald's "Sweet Freedom" and "Baby Come To Me", made popular by Patti Austin and James Ingram. Joan Marie Johnson (Faust) who, along with her cousins Barbara Ann and Rosa Lee Hawkins formed the Dixie Cups and reached #1 in 1964 with "Chapel Of Love", died of congestive heart failure in her native New Orleans at the age of 72. Formed to compete in a high school talent contest in 1963 (as the Mel-Tones), they caught the eye of Joe ("You Talk Too Much") Jones who became their manager (despite their not winning the contest). Joe auditioned the girls for producers Jerry Leiber and Mike Stoller, who signed them to their Red Bird label as the Dixie Cups. The success of "Chapel Of Love" was followed by "People Say" (#12 - 1964) and "Iko Iko" (#20- 1965) but a year later Joan left to battle sickle cell anemia and devote herself to her church. The Dixie Cups were inducted into the Louisiana Music Hall of Fame in 2007. These Tony Award winning artists have joined together to bring many of the forgotten hits of the 60s to audiences worldwide ... and THEY ARE SENSATIONAL! They just did a show in New Brunswick yesterday and are dear friends of Tommy and I. Please check out their website for more details ... I think your readers would enjoy them. 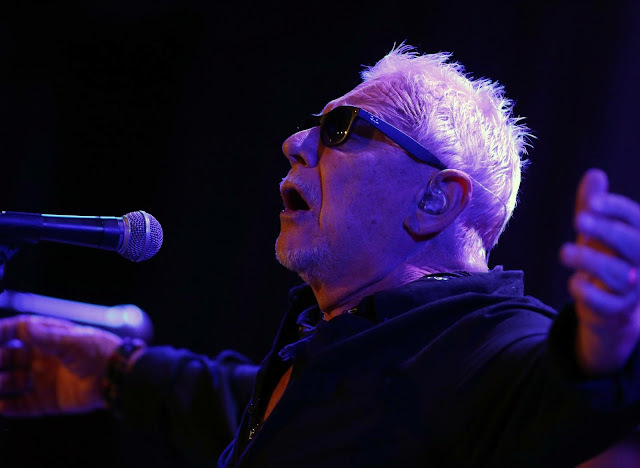 Bob sent us this glowing review of the Eric Burdon show we saw at The City Winery last week ... ironically, it's written by Damian Rico, who sat directly across from me at the very same table the night of the show! (lol) Small world, eh? His is a much kinder take on the show ... which, as I stated in my review, seemed to be enjoyed by the majority of the folks there that night. There’s no question The Beatles and Rolling Stones changed the history and culture of rock and roll in the United States in the '60s. But no single distinctive voice may have been as powerful as electric as blues man and lead singer of the Animals Eric Burdon’s. Burdon’s powerful stage presence and dynamic ability to mesmerize audiences with his hits is still growing strong after six decades in the business. Recent sold-out shows at The City Winery in Chicago are a solid indication of Burdon’s enduring relevance and his fans’ indebtedness for his craft. Burdon played for nearly two hours, taking his audience on his journey from early performances like the Monterey Music Festival, where he performed with the likes of Jimi Hendrix, The Who, Grateful Dead, Janis Joplin, Otis Redding, The Mamas & The Papas and Jefferson Airplane, to name a few. At 75 years old, Burdon is still bringing it. Burdon did an impressive job coupling songs from his newest album “Til Your River Runs Dry” like “Devil and Jesus,” “Bo Diddley Special,” to the classic cuts like “Don’t Let Me Be Misunderstood,” “Monterey,” “Bring It On Home To Me,” “House Of The Rising Sun” before leaving the stage. Burdon is still a force to be reckoned with and his music will continue to stand the test of time. The music video for “Sixteen Tons” by ZZ Top featuring Jeff Beck has just premiered in support of the recent release of the album ZZ Top Live! Greatest Hits From Around the World from Suretone. The piece was directed by Odin Wadleigh who has created music videos and documentaries for numerous artists including Alice In Chains, Kool Keith and Mayer Hawthorne. He melded August, 2016 performance footage of ZZ Top shot on tour in Dayton, Ohio with black and white archival film of ditch diggers, auto workers and (literal) bridge builders as an homage to the travail of the blue collar worker. It is the story behind the track that contains one of the more interesting twists in music history. The Texas trio and British guitar legend Jeff Beck have long been friends, collaborating together on stage occasionally. When a YouTube video surfaced in 2012, purporting to be ZZ Top and Jeff Beck performing the Tennessee Ernie Ford classic “Sixteen Tons,” it seemed entirely plausible, save for the fact that they had never performed that song together in their lives. In reality, it was appropriated from a joint performance at Madison Square Garden in celebration of the 25th anniversary of the Rock and Roll Hall of Fame but “Sixteen Tons” was not on the set list that night. Instead of attempting to file suit against the perpetrator, whose identity still remains a mystery, That Lil’ Ol’ Band From Texas and Mr. Beck embraced it by covering “Sixteen Tons” on their 2014 tour together, using the same arrangement as heard in the hoax video. Live! Greatest Hits From Around the World features two authentic collaborations with Jeff Beck in his native London – “Rough Boy” and “Sixteen Tons.” It is from this version that the music video was spawned. “It’s a mega meta kinda thang,” says ZZ Top frontman Billy F Gibbons. It gets even more meta than that. The most familiar pervious version of “Sixteen Tons” was Tennessee Ernie Ford’s massive 1955 hit that went all the way to #1 on the charts. It was originally recorded in 1946 by country singer Merle Travis who gets writer’s credit. His song is based on folk singer George S. Davis’ “Nine-to-ten Tons,” written in the 1930s. On November 4, ABKCO Films will release a newly restored version of Blindman, the 1971 cult Spaghetti Western starring Tony Anthony and Ringo Starr and directed by Ferdinando Baldi (David and Goliath starring Orson Welles). The DVD, Blu-ray and digital download versions are in HD, mastered from the original 35mm negative. The release is preceded by midnight theatrical screenings at IFC Center in New York City on October 7 and 8, and a double feature with Jodorowsky’s El Topo at the Castro Theater in San Francisco on October 21. Blindman is Baldi’s take on the immensely popular Zatoichi films of Japan. A blind gunman (Tony Anthony) escorts a group of fifty women to Texas, where they are to be married to miners. When the mail order brides are kidnapped by a gang working for two Mexican banditos (one of whom is played by Starr) and their villainous sister, the captors find out their opponent, dependent on his horse and his hearing, is a deadlier challenge than they might have expected. Full of humor, sarcasm and featuring an unforgettable 5.1 audio soundtrack by Stelvio Cipriani, Blindman is one of the most stylish and absurdist of the Spaghetti Westerns from the early ‘70s. Shot at Cinecitta Studios in Rome, and on location in southern Spain, Blindman was co-produced by Tony Anthony, Allen Klein and Saul Swimmer, the latter of whom co-produced the Beatles film Let It Be and directed George Harrison’s The Concert for Bangladesh. Blindman features many classic Spaghetti Western locations in their heyday – the Western town of Decorados in the Tabernas desert, the massive fort built for the American film El Condor, the railroad station from Once Upon a Time in the West, the cortijo from Duck, You Sucker, and the “mission” location featured in The Bounty Killer and Death Rides a Horse. Ringo Starr, having just ignited his solo career the year before, amidst of the dissolution of the Beatles, was so imbued with his role in Blindman that he recorded a song describing the premise of the film. The b-side to his 1972 single “Back Off Boogaloo,” the aptly titled “Blindman” was produced by Klaus Voormann, a member of Plastic Ono Band and cover art designer of the Beatles’ Revolver. Tonight from 10 to 11 New York time = "The Fugitive." For all you youngins out there who thought that today's posting might be a tribute to Joey Fatone and N*Sync, consider this an education!!! My wife and I attended the book release party for Glenn Burger's "Never Say No to a Rock Star" and it was an evening beyond belief! Attached is an article about the evening, along with some photos. http://forgottenhits60s.blogspot.com/2016/09/glenn-berger-never-say-no-to-rock-star.html to read Bob's complete review of Glenn Burger's book. Meanwhile, here is his first-hand account of the party! Readers of FH may recall the review and interview I recently did regarding Glenn Burger’s terrific new book, Never Say No to a Rock Star. If you didn’t, the book is about the author’s time in the 70’s spent as assistant, then recording engineer, to star producer Phil Ramone. It’s so descriptive that the reader feels as if he’s / she’s right there in the studio, smelling the burn of the tubes in the recording equipment, hearing the tape roll and watching the likes of Paul Simon, Bob Dylan, Frank Sinatra, Wilson Pickett, Mick Jagger, The New York Dolls, and other musical luminaries in the studio recording some of their most iconic music. And, then there are the behind-the-scenes stories! Glenn doesn’t hold back in describing some of the appalling behavior of some truly childish, nasty and unreasonable temperamental artists. He compares it to the absolute genius that blasts through the control room speakers. It’s a beautiful dichotomy that is wondrous and revealing to read. Many of the artists are described as lovely and sensitive people ... and, he praises the studio “cats” (musicians) as the secret stars of every recording event. There’s so much more to the book, written from this now-psycho therapist’s grown up and professional point of view about his youth spent in the recording business, as well as of the artists he encountered and worked for. And, to top it all off, Glenn hosted a book release / fundraiser (for MusiCares) last night (September 29) at “The Cutting Room,” in New York City. (Fans may recall that this was the scene of Ron Wood’s two solo concerts about two years ago.) The evening was billed as a “New York Studio Cats Reunion,” and man – was it! My wife, Susie, and I drove into the city, had incredible dinners at “The Cutting Room” and watched with our mouths open (after we ate) and bopping with feet tapping as these mavens of music took us on a rockin’ escalator to nirvana. Robbie Kondor – musical director, “The Nuff Brothers” featuring “Blue” Lou Marini (sax), Kenny Ascher (piano), David Spinozza (guitar), Bette Sussman (musical director for Better Midler, on keyboards and vocals), Irwin Fisch (keyboards), John Siegler (bass), Tom “Bones” Malone (trombone), Curtis King, Jr. (vocals), Valerie Simpson (of Ashford & Simpson), and, from “The World’s Most Dangerous Band,” (billed last night as “Paul Shaffer & The Latest”) none other than Will Lee on bass, Sid McGinnis on guitar and the incredible Paul Shaffer on keyboards, vocals and lotsa schmaltz! You probably recognize a lot of these names from T.V., movies (“The Blues Brothers”) and from album liner notes. The friendly and sociable audience was chock full of recognizable names and faces, and I had the pleasure of meeting the very lovely May Pang. I also bumped into an old, old friend (well – he’s my age), studio guitarist and all around good guy, Craig Snyder, who joined Susie and me at our table, and introduced us to a lot of his friends and colleagues. Author Glenn Burger played the gracious host, making his hundreds of guests feel singular and welcomed, and all-in-all, it was as fun a musical evening as I’ve ever spent, even without my bass plugged in and around my neck. Sometimes you just wanna lay back and let the cats who can really do it, do it. Now, go out and get Glenn Burger’s incredible book, Never Say No to a Rock Star. You’re gonna love it! Glenn Berger, recording engineer and author of "Never Say No to a Rock Star: In The Studio With Dylan, Sinatra, Jagger and More," and Musical Director Robbie Kondor, are hosting this benefit reunion of the musicians, singers, producers, arrangers, engineers, and studio staffs who were behind the hit music recorded in New York studios over the last fifty years. With performances by a host of the greatest musicians and singers alive and surprise guest artists, in both song and story Glenn and Robbie will celebrate these unsung heroes whose contributions to innumerable classic records shaped a generation. Come hang with old friends, share this once-in-a-lifetime event, and contribute to a worthy cause. All net proceeds will be donated directly to MusiCares. MusiCares is the charitable arm of the Recording Academy that provides a safety net of critical assistance for music industry professionals. My curiosity got the better of me ... so I did some digging and came up with this article and interview with Ron Onesti from 2012. (OK, I am absolutely going to have to ask him about this next time I'm there and have him take me on the guided tour!!!) Frickin' amazing! I have known Eric for many years. I haven't seen him in a while, but we are good friends. I hope it was just a bad night. All performers ave bad spells. I went through a period where I thought it was all over, but I took time out and went to a singing coach and it saved me. You also have to consider he may have had a long stretch of work without a lot of rest, which is a killer for singers. I love Eric and I will get in touch with him. He's the real deal and I hope he is okay because he has always given his all. He is strong and let's hope he bounces back. Knowing him, it won't surprise me. Yeah, I'm thinking he may have been sic because his voice was pretty weak ... but from several emails I've received, he seems to be having a bit of a hard time moving around these days. It's a shame because everybody has this image in their heads about the glory days when ALL of us were young ... the audience often forgets that WE'VE gotten older, too. I'm doing something next year that spotlights the entire year of 1967 ... Eric Burdon and the Animals had three or four US chart hits that year ... it would be GREAT if he'd be willing to reflect back on those times, as I think he had sort of "rebuilt" The Animals shortly before then ... their musical direction certainly changed that year with things like "Monterey" and "San Franciscan Nights" ... he was definitely affected by what was going on here in The States during The Summer Of Love. Maybe pass this email along to him and let him know that I would love for him to participate. Regarding Eric Burdon, I remember seeing him a few years ago and his stage moves were limited to a fist pump. He could still sing and, his limitations notwithstanding, performed with conviction. He also gave an engaging interview when we talked to him for Songfacts back in 2010. Did you cut out and save these records from the backs of cereal boxes? Interesting to see that Garth now has more 10 million selling albums than The Beatles. Garth keeps a local-guy low profile (avoiding the high rent district) and is seen around our part of town pretty often at the Chick-Fil-A and other spots. His wife Tricia (Yearwood) is in my wife's Zumba class and is just considered one of the girls. She signs-in with the last name "Brooks", though most don't usually think of her that way. My good and long-time friend, Jon Ashe, has been playing with Tommy James now for a couple of years. Jon played the original bass on "Mony Mony." When I was in The Rip Chords and we opened for Tommy (in, what? 2001 is it?? ), I gave Tommy his old friend's phone number. It only took a decade, but Jon is back. I sent Jon your coverage of the Chicago show, and he, in turn, sent it on to Tommy. Booked like crazy, they are, and deservedly so. I'll keep you posted. Have a cool weekend, my friend. First I've ever heard about the Al Capone connection but who knows ... he had his hands in everything back then! UPDATE: After doing a little bit of digging I found this little piece of information regarding Capone's ties to The Arcada Theatre. I never knew ... had absolutely NO idea ... but next time I'm there, I'm going to have to have Ron Onesti take me on the official guided tour! Saw Brian Wilson, Al Jardine and their Pet Sounds Concert Saturday at the Chicago Theater and all I can say it was F A N T A S T I C !!!!!! They opened up with "California Girls" and it blew the roof off the theater ... what a sound!!! The musicians sounded GREAT and they duplicated the numerous sounds of the Pet Sound recordings to perfection. We were also treated to their Big Hits and all I can say is Brian Wilson and Al Jardine have a lot of stamina and I am so glad I got to see them perform!!! Well over two hours on the stage and the audience wanted MORE!!!! Man, did your review of the Lou Gramm concert hit home today! I know you were looking forward to it, but when a famous group is so loud that it has gone way beyond a point where you think the nails and screws are coming out of the walls, then it is time to leave! I love the band, Foreigner with Lou in front, but when volume is more of a factor than the music is, well, that's another story. Don't get me wrong, I would love to hear the Lou Gramm Band, but maybe at an outside venue, where I can escape somehow. In my opinion, he is one of the trio of "voices" of the eighties, along with Steve Perry and Brad Delp (three singing heroes of mine). I would really like to hear what he can do these days, without having to put up with all the decibels. I have a Foreigner reunion DVD put away in a box somewhere, probably recorded close to twenty years ago. I know that Gramm had gone through all the health issues, so I was trying to be understanding, but his voice was so off that I actually felt sorry for him. However, as years have gone by, maybe he sounds pretty good now. Doesn't matter what your musical tastes are ... you'll find something for EVERYBODY at The Arcada Theatre in St. Charles, IL. '50's Music? Bobby Rydell hits the Arcada stage on November 26th ... and Pat Boone will be doing a show with his daughter Debby on October 16th. You can also catch Little Anthony and the Imperials on October 23rd ... they put on a GREAT show last time I saw them. '60's Music more your style? Then how about Johnny Rivers? He's coming to The Arcada on October 9th. And then on November 4th, The Arcada plays host to Ms. Dionne Warwick, one of the most memorable voices of our time. The '70's are well represented, too. America graces The Arcada stage on November 18th ... and Tony Orlando is back on December 10th. This Friday (October 7th) you can catch soulful sounds of The Stylistics ... or kick it up a notch with The Charlie Daniels Band on November 3rd or Roger Hodgson of Supertramp on December 8th and 9th. They've got music for every style and taste ... how about Dr. Demento on October 27th? Blues Legend Buddy Guy on October 8th. Chazz Palminteri puts on a one-man show of his pride and joy, "A Bronx Tale" on October 15th. Or catch Gallagher on October 21st. The Ides of March and the Brian Setzer Orchestra are both putting on Christmas Shows at The Arcada on December 16th and November 15th respectively. And Edgar Winter and Starship (featuring Mickey Thomas) have shows lined up, too.